Monday was a big day that week. 23 September 2013 was the deadline for suppliers to put in their bids. Then time was up. All those eager candidates who handed in their scripts on time just had to sit back and wait for their exam results. The examiners put out a bulletin a few days later, on 26 September 2013: "G-Cloud was set up to be a new platform for the public sector to buy ICT ..., specifically cloud services, in a simpler, clearer and faster way". "Simpler, clearer and faster"? Haven't you heard that somewhere before? Yes, you have, it's the slogan on GDS's GOV.UK, "the best place to find government services and information". 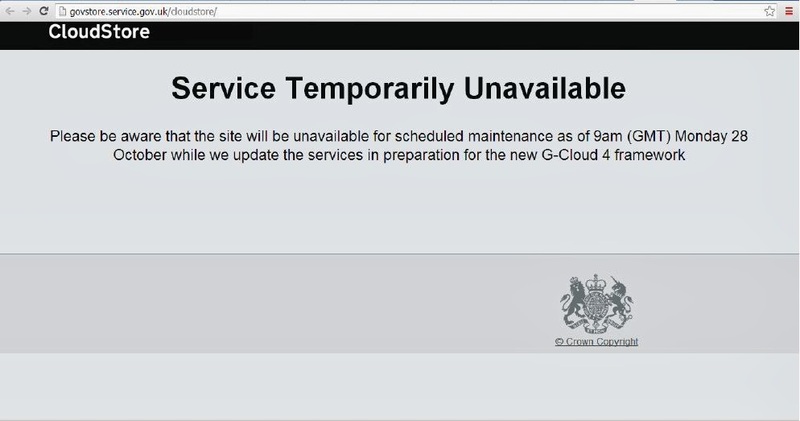 That's the Government Digital Service's way of reminding all the applicants that GDS are in charge of G-Cloud now, and have been since 1 June 2013. Two weeks later, 10 October 2013, GDS blogged again: "If you've applied for G-Cloud 4 you should be hearing shortly as to whether you have been successful. Your services will then be listed in the CloudStore ...". CloudStore will be unavailable from 9am (GMT) Mon 28 - Tues 29 Oct 2013 while we update services for the G4 framework. Etc ... Lots of proud SMEs, all looking forward to selling their wares on the CloudStore. You get the picture. And that was the picture on 29 October 2013. Not a supplier or a product in sight. And on 30 October 2013. The shop was still shut. And on 31 October 2013 until just gone 5 o'clock. Four days. As Chris Chant would say, "unacceptable". What was it that ex-Guardian man Mike Bracken, the executive director of GDS and the prophet of so-called "agile" computing, said after he attended a Cabinet meeting on 29 October 2013? Starting with the needs of users has led to a radical shift in the way we build and provision government services. That’s a huge thing. It means an end to big IT, it means smarter and cheaper services which meet users needs, and it means digital sitting at the heart of teams all around government. For four days his users were left with no service. What is your reaction to HealthCare.gov and what you're reading and seeing regarding failures of what was meant to be an Expedia shopping for health coverage? Yeah ... I'll say this with no sense of enjoyment whatsoever, but it feels a bit like Groundhog Day to where we were three or four years ago. Hundreds of millions of dollars, large-scale IT enterprise technology, no real user testing, no real focus on end users, all done behind a black box, and not in an agile way but in a big waterfall way, which is a software methodology. And basically not proven good value, and I'm afraid to say I've got example after example in the U.K. in the past where we've had that experience. So it looks just like one of those. Delivery, eh? And user needs. It's not just "big IT" that fails. Let's hope that the government aren't hoping to make an electoral issue out of GDS and the "smarter and cheaper services which meet users needs" that they promise. For four days no services were available at all. Just ask any of the new boys in the school, like UK Backup, Advice Cloud and Damovo above. Just ask any of their appalled clients. Groundhog Day, indeed. @G_Cloud_UK Hi, any news on when suppliers will be able to access the #cloudstore admin area to edit their services?